This workshop focuses on the road safety barrier systems used for temporary traffic management. This workshop will be necessary for those who design, install and/or check/audit temporary road safety barrier systems. 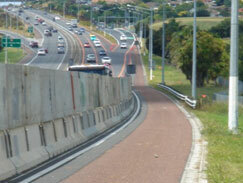 NZTA and Local Authority Staff, Consultants and Contractors responsible for temporary road safety barrier installation, checks, audits, or maintenance should attend and complete the practical assessment. There are NO Pre-requisite required for this course. The course is held over two days. Day 1 INSTALLERS and DESIGNERS 8.30am – 4.30am A Mix of Theory, product inspection and Site visits, relevant to both. Day 2 DESIGNERS ONLY 8.30am – 4.30pm A Continuation of course and practical material specific to Designer criteria. Morning Teas, Lunch, and Afternoon Teas will be provided on both days. The fees for the course are set at two levels to allow for additional material for Designers. In future consultants and contractors carrying out: TMP design, installation, checks or audits involving temporary road safety barriers; will need to have attended this practical workshop and demonstrated their proficiency through completion of a practical assessment. A list of those who have achieved this qualification will be placed on the NZTA Website.